Offer a bevy of birds their favorite foods at once using the Pine Tree Farms Fruit and Nut Classic Seed Log. Sunflower seed, millet, tree nuts, corn, and dried fruit combine in this log to delight many different birds. 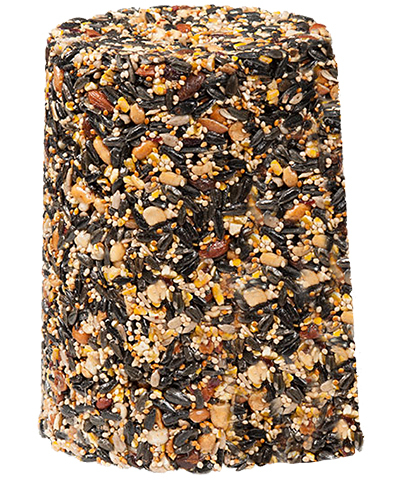 This blend of ingredients offers birds the nutrition they need to maintain their high metabolisms. Its handy log shape makes feeding both fun and convenient, and a gelatin binding keeps the item nicely formed. Place this unit in your existing Pine Tree Farms Classic Seed Log Feeder (not included) and hang it from a branch or bracket, or rest it on a tray for more birds to find it. Show your appreciation for birds by offering them a treat with this Fruit and Nut Classic Seed Log. Made in the USA. Note: This case pack includes 6 Pine Tree Farms Fruit and Nut Classic Seed Logs, 4.25 lbs. each.